Without particularly planning it one way or another, Ricky and I ended up being in Vietnam for the Lunar New Year. Last year I was in Australia so I missed the big shabang over in Asia and didn’t really know what it was all about aside from the Korean tradition of eating rice cake soup to symbolically “become a year older”. 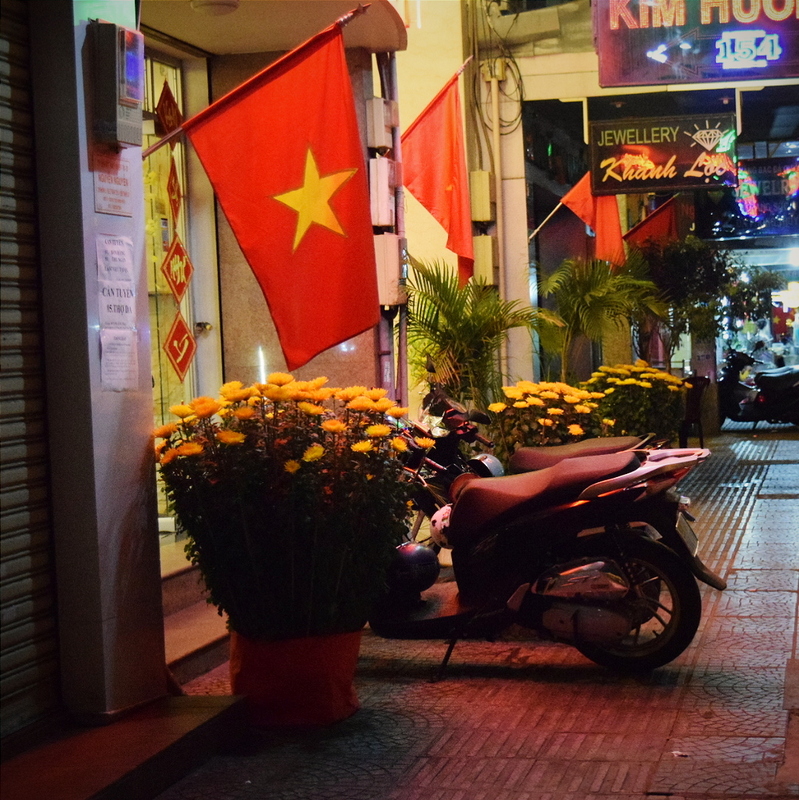 So when we got to Ho Chi Minh, we were quite surprised to see it all done up in its Sunday best. Everywhere there were hundreds of densely potted yellow carnations and tall sunflowers waving in the breeze and miniature fruit-laden cumquat shrubs bouncing off the backs of the thousands of scooters zooming through the streets. 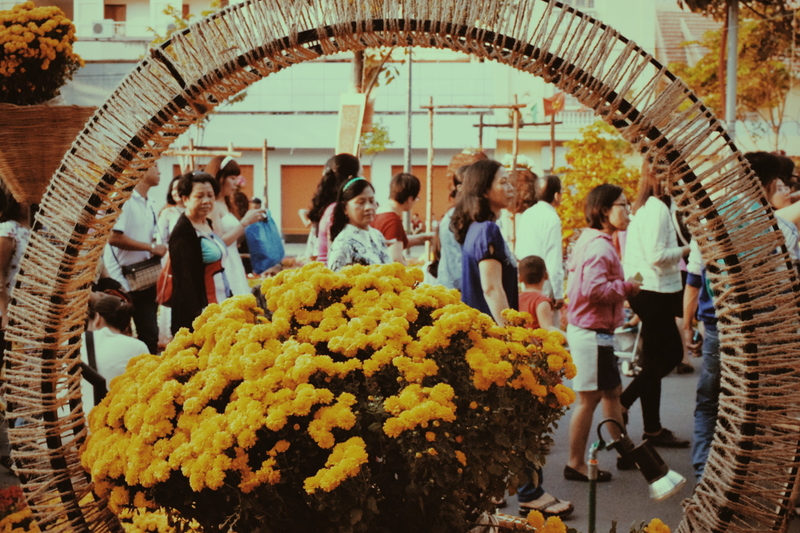 Across main roadways were archways decorated with giant yellow flowers 3-5 feet in diameter. At the entrance of every shop, restaurant, and hotel were baskets of yellow flora brimming with happiness. 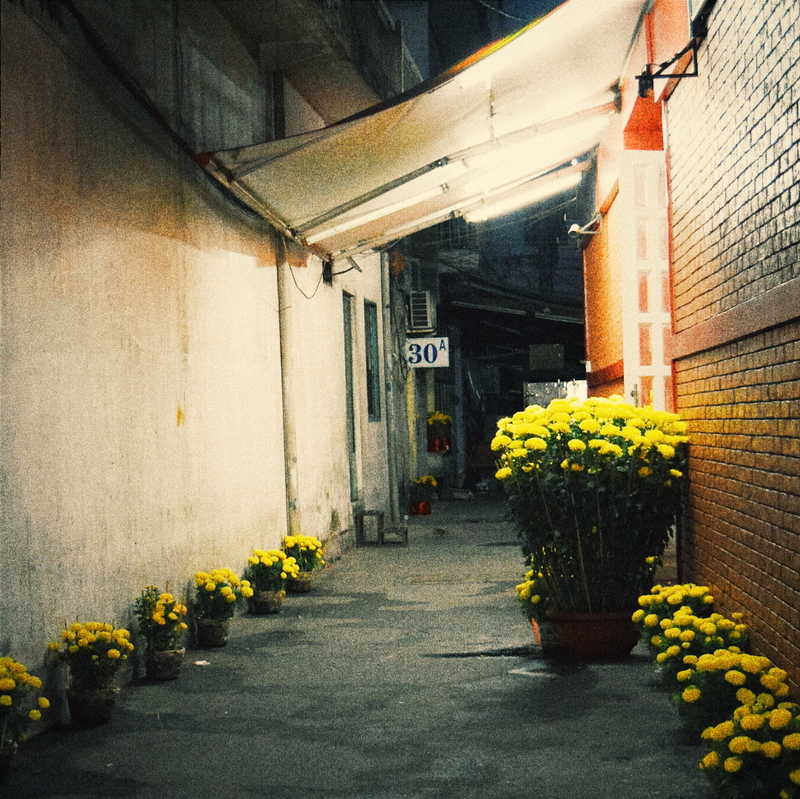 Yellow flowers at the entrance of every shop. Because that is what we were later told by a local: yellow is the symbol of happiness and auspiciousness and so to bring about those things in the Lunar New Year, the Vietnamese put them everywhere. Even the alleyways are decorated. To say it was beautiful would be to stick a platitude on a truly euphoric time of year. The people were all smiling; vendors wished us happy new year when we bought from them, and we wished our cab or tuktuk drivers happy new year when we got out. At the market, as I previously mentioned, they were happy to lower their prices and make exceptional deals to bring them luck in the new year. “Lucky sale! Lucky sale!” they’d coerce us with, even if we had no interest in purchasing their wares. Perhaps one of the most beautiful things we encountered though was Flower Street. An entire segment of roadway had been sectioned off for what was essentially a temporary botanical garden. I don’t know which there were more of: people or flowers. 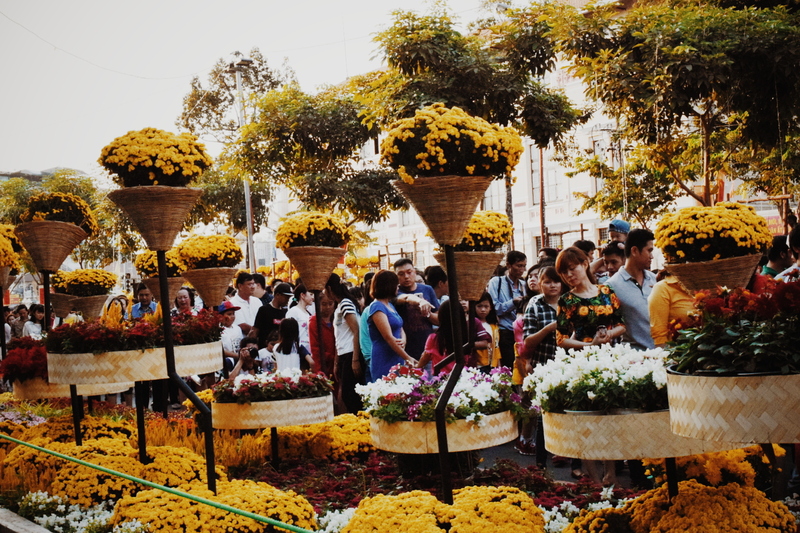 All along the street were topiaries and floral sculptures in yellow. It was so busy though (not to mention extraordinarily hot that day) that it was hard to get many photos. 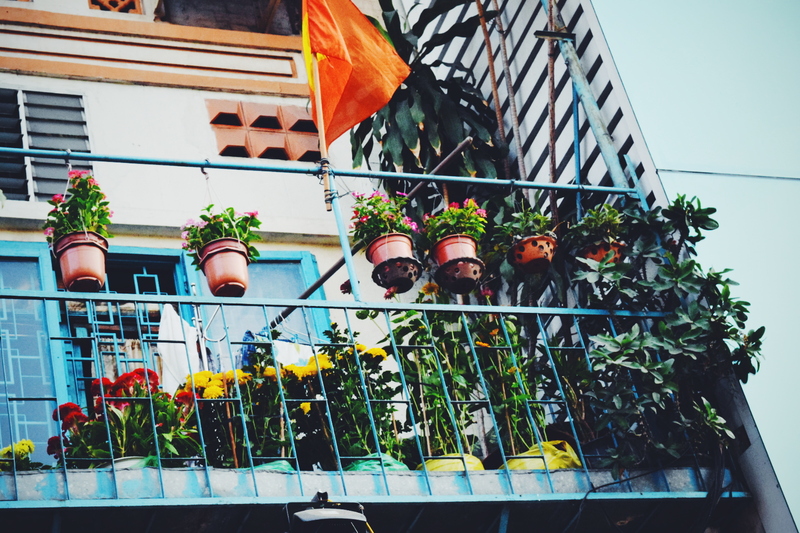 Apartment balcony along flower street bursting with a potted garden of its own. Yet all along we saw couples, families, friends, and solo travellers taking pictures and selfies with the colourful displays. We walked down the road for so long that we just ended up collapsing in bed that night. Except for that was the night we heard the explosions. Roused from our drowsy states we looked at each other in worry. What was going on? The bangs continued like bombs being dropped – which to our exhausted and war-museum-filled minds made perfect sense at the time. Then it came to me. We hadn’t even known it had been Lunar New Year’s Eve, but whether we were ready or not for it, fireworks went off at the stroke of midnight. “Let’s go watch,” I said to Ricky. We put on our dressing robes and traipsed to the balcony. Luckily our room was on the fourth floor and our hotel was quite tall so we had an amazing view. Nearly right in front of us was an ecstatic firework display – but it didn’t end there. 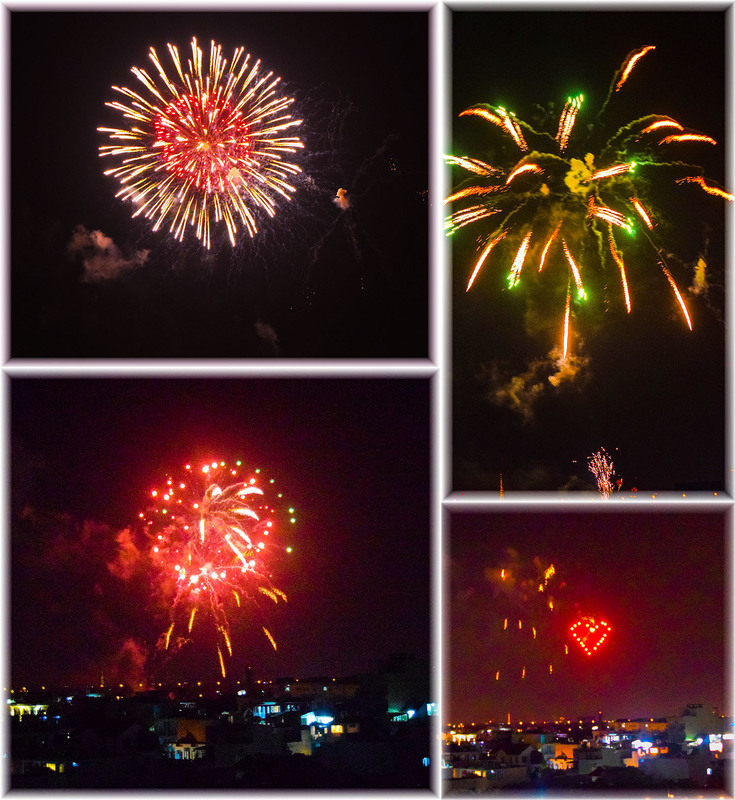 Everywhere we turned – behind us, in the far distance, slightly to the right – there were fireworks all across Ho Chi Minh. It was as though the whole city suddenly exploded. Fireworks seen from our hotel roof. Photos by Ricky. Being close to the airport, the planes came in low in front of us, probably right in between our hotel and the closest fireworks display. Though it must have been terrifying for the pilots, it had to be absolutely beautiful to witness for the passengers. It was one of those moments that’s worth traveling for and a memory I’ll cherish forever. Sunflowers being my favourite flower, I was quite biased in enjoying this holiday’s choice of décor. We only had one day of closed shops though because again, conveniently, we left a day later to go to Cambodia where their Lunar New Year only falls in April. Thus we were guaranteed plenty of activities to keep us busy. But that’s all for now! Keep posted for my next adventure in which imma enthral y’all with the tales (and delicious photos) of our cooking class! This has been an exciting trip so far in many ways. It’s full of surprises and keeps getting better. I am SO glad you experienced this there! That alley shot made me happy just seeing those flowers in an unexpected area. Who could NOT be happy? And knowing the history of the war, you appreciate happiness and beauty even more. 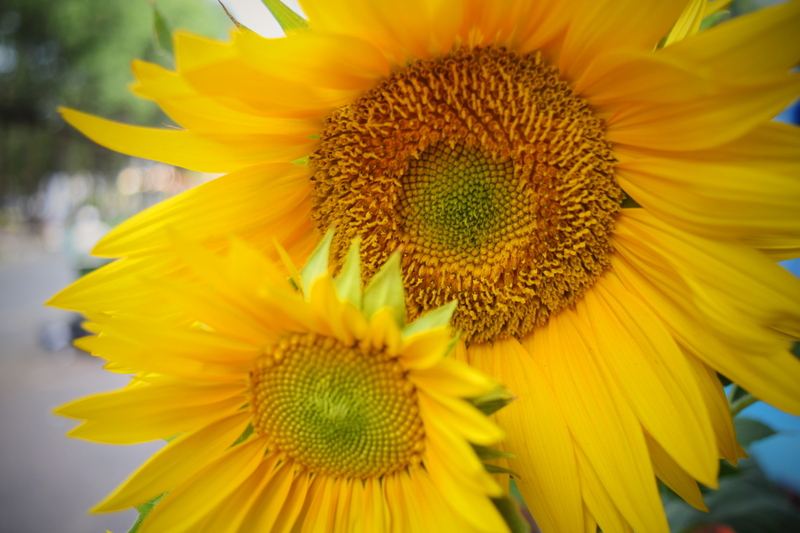 And sunflowers…Ganesha and now sunflowers…I would say you have some VERY clear signs of good beginnings ahead!!! !